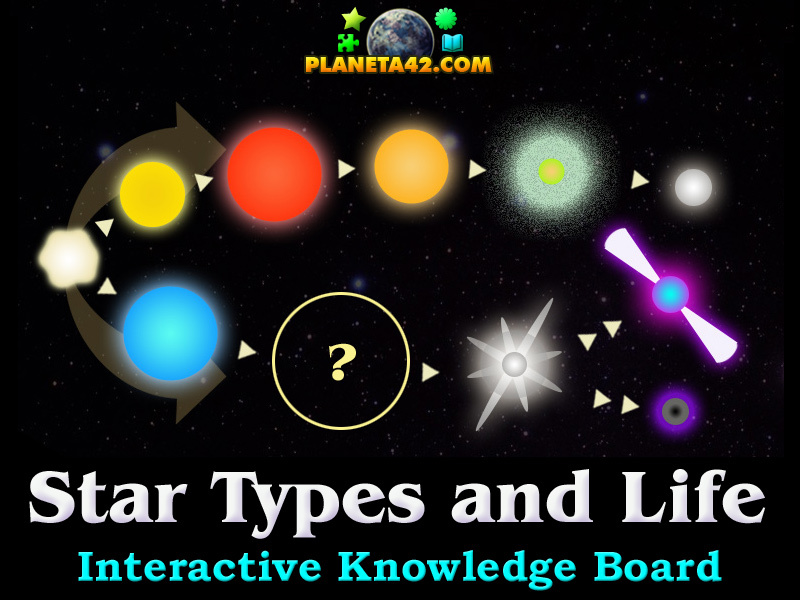 11 star types and the stellar evolution in a fun educational class game for astronomy. in the stellar development and evolution. This application may be used as educational tool in astonomy classes, online courses, school lessons and home education. Drag and drop the stars in the stellar life diagram. The Astronomy Knowledge Board include 11 pictures and shapes of different stars to play with. The game is part of the Interactive Astronomy Observatory educational tools. Which are the most notable star types? Does the mass of a starr matter for its type? Which is the youngest star type? In how many ways may a star life end? How to play Star Types Puzzle. There are the 11 stars on the top of the screen. Drag and drop them in the empty slots on the diagram of the stellar evolution. Know 5 major star types. Class subject: Star types and stellar life. 1. Beginning from left to right, the first type of star is the Protostar. A protostar is a very young star that is still gathering mass from its parent molecular cloud. When the protostar cycle ends, the star will become another type of star, depending on its mass. 2. Continuing with the low mass stars, there is the Yellow star. The sun in our Solar system is a yellow star. Yellow stars are relatively young stars. 3. Then the yellow star may become a red giant. Red giants expand in size as the sun begins to burn its fuel rapidly. When our sun become a red star(and it will), it will swallow the Earth, and if we do not find another habitable planet, the human will extinct. But, getting bigger the sun will worm nearest planets, and even Pluto may become habitable. 4. When the sun's fuel begin to deplete, it will turn in an orange star. Sometimes, yellow stars skip the red giant phase and become directly an orange star. It is believed that orange stars contain teh most paradise planets, but we are yet to confirm it. 5. The next stage in low mass stars is the Planetary Nebula. The star is almost at the end of its life. 6. 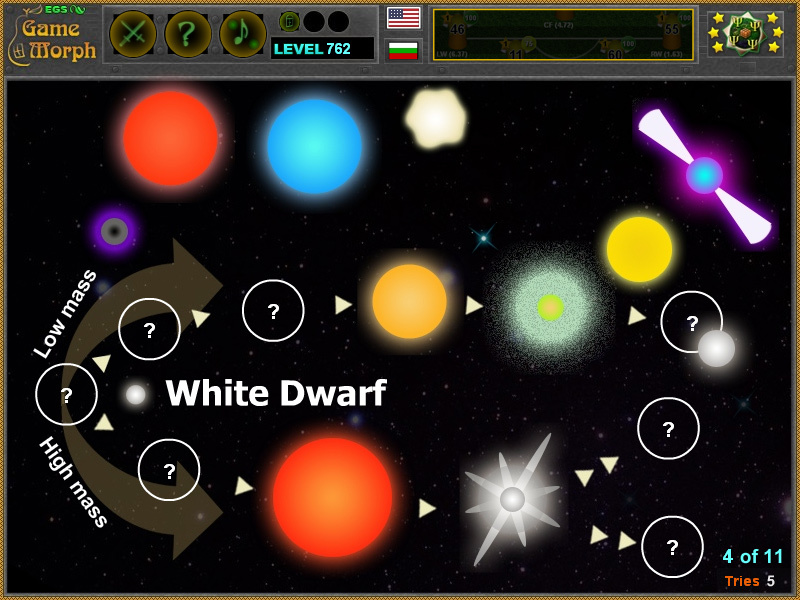 The last phase of a star life is the White Dwarf. Only the stellar core remain composed mostly of electron-degenerate matter. The star mass is still near the original mass of the sun, but the size may be as little as planet Earth. Remember, because it is a low mass starr, it will not become a neutron star, and the white dwarf may exist for billions of years. Infact, the observable galaxy is still too young to see what is next after the white dwarf! 7. Now let's see what happenes with high mass stars. After their period as protostars, some stars will become Blue Giant, and some will jump to Red Super Giants. Some may be in size of the sun in its early stages, but with the higher mass (at leats 10 times the sun), they will become Red Supergiants, rather than Red Giants. 8. The Red Super Giants have a tremendous mass and size. They may be 500 - 900 times bigger than the sun! 10. Now after the Supernova, if the star finds a gravitational stability, that compresses the core past the white dwarf star density, it will turn into a Neutron Star. The Neutron Stars are the smallest and the densest stars in teh universe. They typically have a radius of 10 kilometers, but weight two times of our sun! 11. Or after the Supernova, if the star colapses at the end of its life cycle, it will create a Black Hole. Black holes are regions with so big gravity, that even light can not escpae the gravitational pull. To define the "place of no return" the astronomers have defined the Event horizon. Blach holes are fovorite subject in a lot of sci-fi movies. Labels: Astronomy Games , Stars , Puzzle Games , Flash Games , Knowledge Games , Education Games , Free Online Games.